This current publication is contributed by Ruben, one of my close friend at SBM-ITB. Look forward for your other publications in our blog bro! 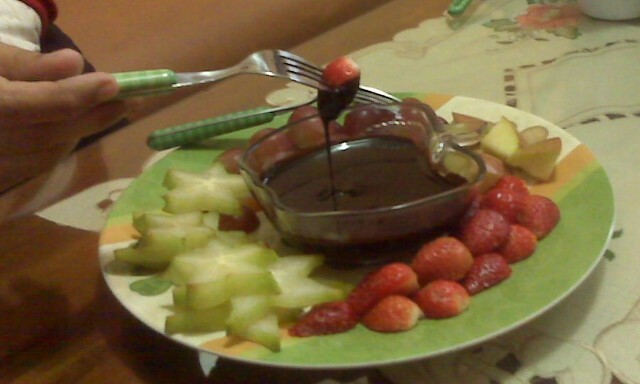 I got idea to spend afternoon as much fun as possible, to eat fruits dipped in chocolate fondue. So we went out to nearest supermarket Yogya Griya, buying out ingriedients. So let me list it for you: dark cooking chocolate, whipped cream, and rum. The last item is the most expensive one, more than Rp 50.000 for small 100ml bottle. We opted rum essence Rp 17.000 50 ml bottle. Of course it tastes like rum but I didn't expect rum spirit. Don't forget to grab fruits and put it on your shopping basket. 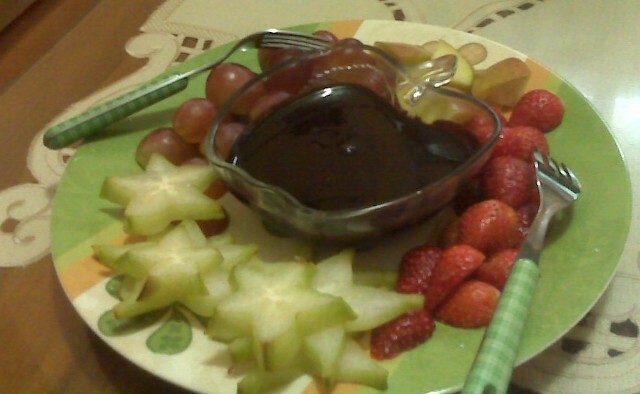 Sour fruits just taste better than sweet fruit dipped in choco fondue. I gave a shot to dip red grapes, and I don't like it as much as sour fruits. Sweet fruits and sweet chocolate are not good pair. I picked star fruits, strawberries, Apel Malang- apples originated from Batu Malang. Also I picked red grapes, and I don't recommend this fruits. I do encourage you to try green grapes which tastes more sour than red grapes. Please tell me if you try that, I am still curious about that. Anyway Apel Malang was not good, was not as crunchy as used to be. I regret it so much to buy it. Rushing to home, I couldn't wait to melt to chocolate. I filled pan with water around one-third, then put it on stove to boil it. Made the chocolate into small pieces, and put those small pieces on another metal pot. After waiting to warm up the water, put the metal pot contains small-piece chocolate into the warm pan. Let the chocolate melt as the temperature keep rising. Meanwhile I prepared whipped cream, as I bought cream powder. Add cold water to powder and then stirred it rather fast. As the chocolate becomes liquid enough, add the whipped cream. Anyway I only use about 125gr chocolate, 60cc whipped cream, and one half spoon of rum essence. Here the picture I took before I ate all of it. Please forgive I am not sharing the fondue with you. Only sharing the picture. Enjoy!